You may have come across a situation where you needed to save a phone number on your iPhone during a call and there was nothing nearby to record the number. In this post you will learn some easy ways to record a phone number on your iPhone while the call is in progress. Let us assume that you are engaged in a conversation on your iPhone and the person at the other end provides you with an important phone number. Noticing that there is nothing nearby to write down the call you tap on the keypad (natural reaction in such situations) and input the phone number on the keypad, hoping that you will be able find a pen and paper after the call has ended. However, you are mistaken in case you think that the number that just recorded on the keypad will be available for you after the call has ended. Strangely, your iPhone will immediately erase your keypad entry once the call has ended, leaving you with no option but to call back your contact in order to ask for the number. Fortunately, there are some other ways to save a phone number on your iPhone while the call is in progress, we will be showing you some of them. You don’t have to always think in terms of grabbing a pen and paper whenever you want to note down a phone number or other information during a call on your iPhone. Instead you can make use of the Notes app on your iPhone to record such information. 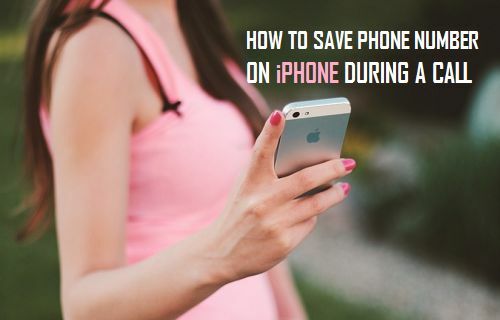 There are times when you cannot put the phone on speaker mode, this makes it difficult to use the first method of saving the phone number to notes app. In such a situation, you can follow the steps below to note down a phone number while the call is in progress on your iPhone. 1. Take the phone away from your ear while the call is in progress. This wakes up the device display as your iPhone’s ambient light sensor detects your action. 2. Tap on Contacts – This brings up the Add contact screen while the ongoing call runs in the background. 4. 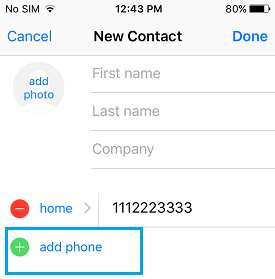 Next, tap on the Add phone option and input the number that you want to save on your iPhone (phone number as dictated by the caller). 5. You can also type in additional information like First name, Last name and the Company of your new contact. 6. Tap on Done (top-right corner).